Nearly every Thursday night from about 5.00pm there are organised “club” rides from The Olde Duck. In summer these will be in the daylight but in Winter good lights will be required – as well as some nice warm clothing. These rides are sometimes part of a sponsored time trial series, taking in one or two loops of the Intshitshi and Umzimkulu trails – and/or just fun rides on some of the other trails. Non-members are welcome. Invariably the weekly rides are followed by a very sociable bring and share braai on “Old Smokey” – where members are asked to join the “host “the “One and Oni from Benoni” and bring some salads to go with the large and diverse variety of meat, poultry and fish put to the braai. Discussions are serious, deep and intense, solving all the problems of the world, and go on long into the night. 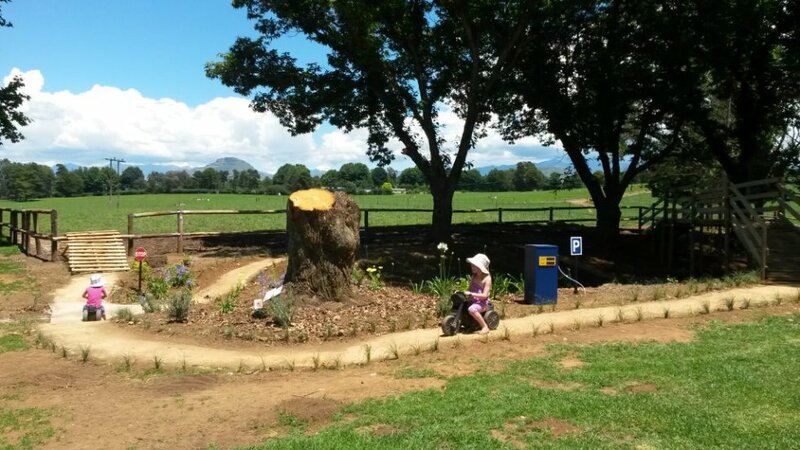 From about 4.00pm on some Thursday afternoons, the kids are invited to ride on the specifically built kiddies Olde Duck track – followed by some real fresh milk shakes. The kids just love it – and what a way to introduce them to mountain biking. On occasion, there will be rides organised by Sani Spoors, finishing off with hot showers and a sociable get together at the Sani Spoors clubhouse (which is also located at The Olde Duck). These will be well advertised in advance and non-members will always be welcome at a small fee. The main events presented by Sani Spoors are the Eurosteel Drak MTB Descent, two day stage race – which is held annually in conjunction with the Drak Challenge canoe race on the last weekend in January. This very popular one-of-a-kind event is the first stage race on the calendar and over the two days closely follows the course of the Umzimkulu River (and the canoeists on it) from Restmount Children’s Home down to the Umzimkulu River Lodge. This is a fun but technically challenging ride. In addition we present the GWK Run-the-rivers Trail Run. We are privileged to offer these events due to the support of our title sponsors Eurosteel as well as GWK, FNB, Gooderson Leisure, Spar and Kalbo Designs. Sani Spoors also helps organise the annual PH2 event ( which is a mtb/canoe/run/horse ride relay) which brings the whole sporting community of Underberg together and also an MTB Ride Against the Horses – which is held in conjunction with the annual UFA agricultural show.